Peanut-y goodness, in liquor form. It goes without saying, but this is not a recipe for those with peanut allergies. This recipes does contain nuts. The nuts soak in vodka overnight. 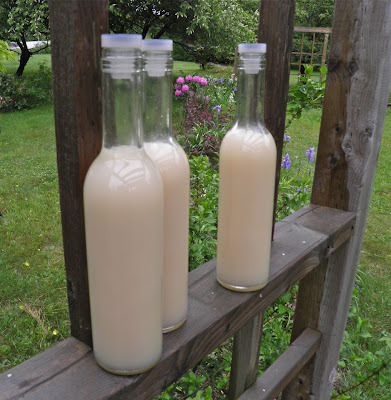 But it’s not so nuts to make nut-flavoured liqueurs. There are many on the market. Baileys is a prime example. It is hazelnut flavoured. This recipe stems from my recent foray into almond milk. It was very successful – and very almond-y. It gave me pause and made me think. I have made nut liqueurs in the past and peanut liqueur in particular. The recipe is here. 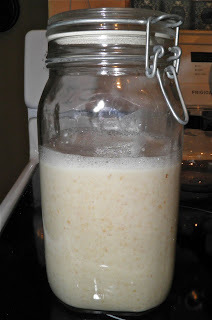 It included whey and took four weeks to infuse. Certainly not a quick recipe. Well, I do believe I have “cracked the nut” so to speak. I have shortened the time to 2 days, and I do believe this method infuses even more peanut flavour into the end result. Why I didn’t think of it sooner is beyond me. 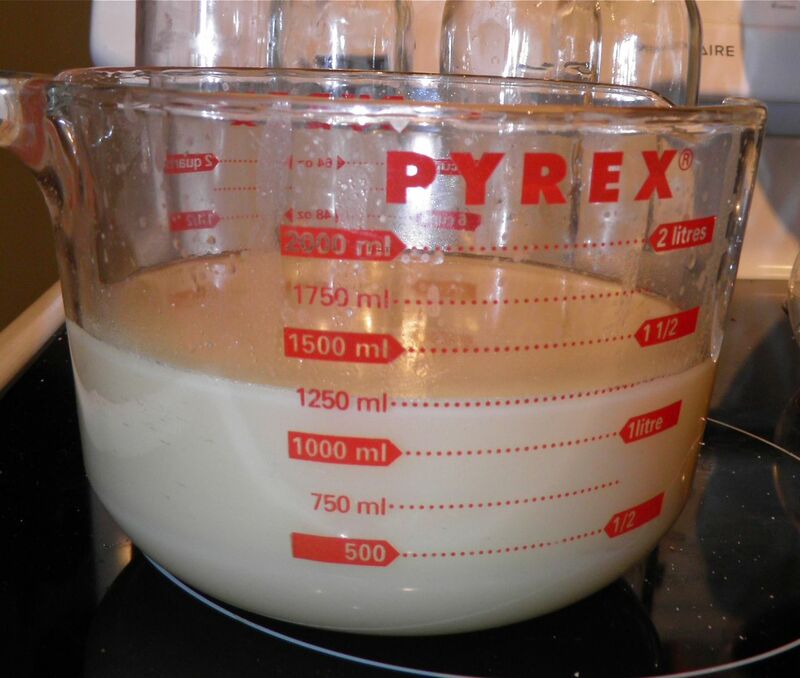 The recipe does not use peanut butter, but uses part of the same technique. If you’ve ever made peanut butter (recipe here) you know that it’s essentially peanuts just ground into a paste. It’s often sweetened a little, but nothing more. This one just adds booze. After puréeing, it sits again for 24 hours. I know I haven’t posted a liqueur in quite some time so I was about due. This one is good. People have asked me how long liqueurs will last, and I have to admit I’m not really sure. I guess it depends on what goes into it. Some liqueurs with a lot of botanicals should probably be consumed in a couple months, those with cream even sooner. Others – like tea or coffee liqueur – should last a very long time. I proffer that this liqueur won’t hang around long enough for you to worry. I let it slip yesterday I was in the process of making this. Someone posted the question “why?”. Nut liqueurs are amazingly interesting and can be used in many mixed drinks or straight up. But treat this one with respect. It’s only been cut 50% in volume from the original vodka, so I would suggest it’s around 20% alc./vol. How would I use it? Two that spring to mind are both Thai inspired. How about that for interesting backyard drinks? This has no stabilizers or milk products so it won't be quite as creamy as other "cream" liqueurs. So give it a brief shake before using. I’m probably going to test drive this on my friends this weekend. So they had better watch out. 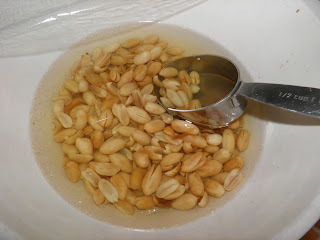 The resulting infusion after the peanuts have been removed. Place the peanuts and vodka in a bowl. Cover with plastic wrap and let sit overnight on the counter to swell. The next day, purée the peanuts and vodka in a blender until quite smooth. The consistency should be like small peanut “meal” in the liquid. Pour the purée into a large mason jar, or similar, seal and place in the refrigerator for 24 hours. 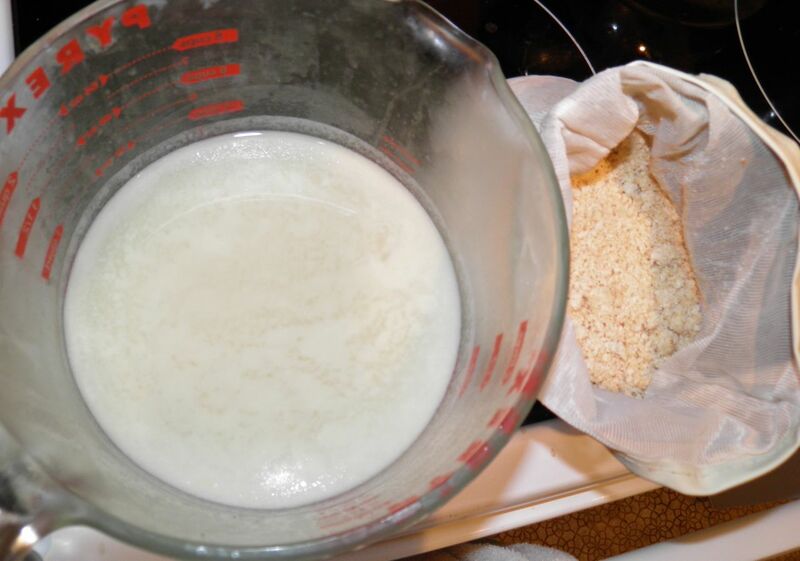 After the peanuts have infused the vodka, strain through several layers of cheesecloth, or a jelly bag to remove the peanut meat. Squeeze until as much liquid is extracted as you can comes out. The last bit of the squeezing will be quite creamy. You will get not quite the whole 750 ml of liquid back out. Some stays in the peanut meal. Bring the sugar and water to a boil and let cook for 10 minutes. Wash and sterilize three 375 ml bottles and tops. Mix the simple syrup with the peanut flavoured vodka. Add the salt if desired. Stir well, pour into the prepared bottles and refrigerate. Shake before using. 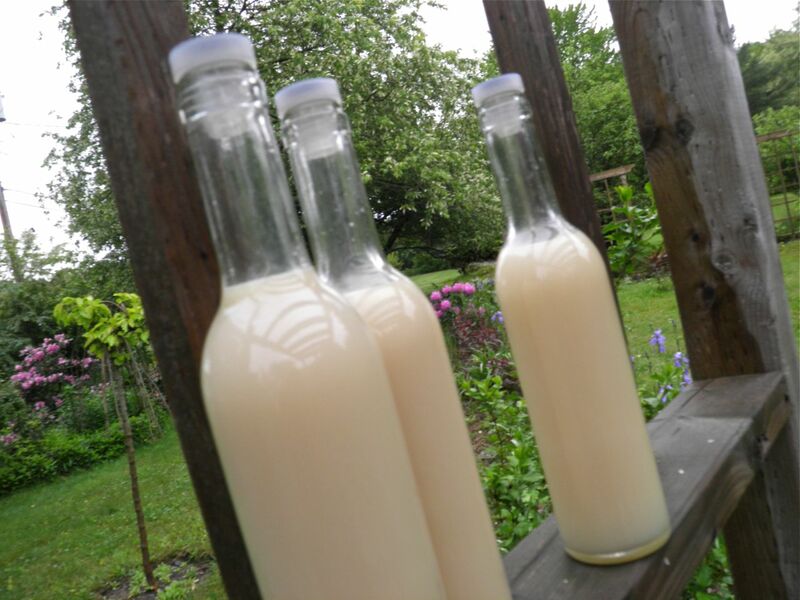 This liqueur should last a 2-3 months unrefrigerated, or longer in the ‘fridge.